Aargh - the school inspectors have arrived. There's trouble at school, but Casper and his friends have an out-of-this-world secret ...they're all superheroes. Masher McNee and his monster zombie mob are no match for their extra-special powers in the playground. Wham-Bam-Jelly-And-Jam. Aargh - the school inspectors have arrived! There's trouble at school, but Casper and his friends have an out-of-this-world secret ...they're all superheroes! Masher McNee and his monster zombie mob are no match for their extra-special powers in the playground. Wham-Bam-Jelly-And-Jam! With a snoring zombie giving Casper sleepless nights, and a gruesome discovery for show-and-tell, the Cartoon Kid is ready for anything - dead or alive! Spluddd!!!Spinng!!!!Boofff!!!!! 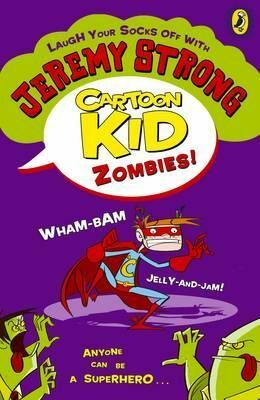 Three funny stories in one book for 6+ by Jeremy Strong, the award-winning author of "The Hundred-Mile-an-Hour Dog" and "My Brother's Famous Bottom". Perfect for fans of "Diary of a Wimpy Kid" by Jeff Kinney, and Liz Pichon's "The Brilliant World of Tom Gates".